Reb Zalman Schachter-Shalomi, the visionary and inspiring rabbi, founder of the Jewish Renewal Movement, passed away at his home in Boulder, Colorado, July 3, just months before his 90th birthday. Known simply as Reb Zalman to his legion of followers, he spanned the old world of pre-Holocaust Europe and the contemporary digital and global community of the 21st century, integrating the most sophisticated technologies into his outreach to a new generation. He understood the depth, the beauty and the love of the old world of Hasidim through the deep connection he had to that world in his early years. Yet for much of his life, especially from the 60′s onward, he was a beacon of light to a younger generation, who had little understanding of that world. His universal message was powerfully influenced by his rich Jewish roots. Meshullam Zalman Schachter was born in 1924 in Poland, a year before his family moved to Vienna, Austria, where he spent most of his childhood. His father, a Belzer hasid with liberal tendencies, had him educated in both a ‘leftist’ Zionist high school and a traditional Orthodox yeshiva, instilling in him a breadth of learning and perspective that formed the base of his ecumenical understanding and vision that is a hallmark of his life’s work and teachings. In 1938, when he was just 14, his family began a long, dangerous flight from Nazi oppression through Belgium, France, North Africa, and the Caribbean, until they finally landed in New York City in 1941, where he later received his rabbinic ordination from the Habad ‘Lubavitcher Yeshiva’. In 1948, he began to travel to college campuses with his dear friend and colleague, Rabbi Shlomo Carlebach, at the direction of the Sixth Lubavitcher Rebbe and took up a post as a congregational rabbi in Fall River, MA. By 1956, he had acquired a Master of Arts degree in the Psychology of Religion (pastoral counseling) from Boston University and had taken up a teaching post in the Department of Religion at the University of Manitoba, Winnipeg, Canada, which he would hold until 1975. In 1958, he wrote and privately published what was perhaps the first book on Jewish meditation in English. Later reprinted in The Jewish Catalog, this little manual would be read by an entire generation of Jews, and would reach individuals as diverse as President Zalman Shazar of Israel and the Christian monk and spiritual activist, Thomas Merton. From the earliest days of Reb Zalman’s career, he was continually involved in ecumenical dialogue with leaders and practitioners of other spiritual paths. The peak of this ecumenical work had to do with the increasingly significant dialogue between Jews and Buddhists. Always sensitive and sympathetic to Jewish involvement in Eastern traditions, in 1990, Reb Zalman was invited to a meeting in Dharamsala, India, between the Dalai Lama and Jewish leaders, to discuss how Tibetan Buddhism might “survive in exile.” This dialogue, and Reb Zalman’s remarkable influence upon it, became the focus of a best-selling book by Rodger Kamenetz, The Jew in the Lotus. With a small circle of students, Reb Zalman founded the neo-Hasidic B’nai Or Religious Fellowship in 1964 in Philadelphia which evolved, in 1986, into P’nai Or (‘faces of light’) Religious Fellowship, which would later undergo one more transformation and take up its current name, ALEPH: Alliance for Jewish Renewal, the core institution in the Jewish Renewal movement that is “ dedicated to the Jewish people’s sacred purpose of partnership with the Divine in the inseparable tasks of healing the world and healing our hearts.” In 1974, Reb Zalman ordained his first rabbi and laid the groundwork for the ALEPH Ordination Program. In 1975, Reb Zalman became professor of Jewish Mysticism and Psychology of Religion at Temple University, where he stayed until his early retirement in 1987, when he was named professor emeritus. Like other Hasidic masters, Reb Zalman encouraged followers to seek a direct experience of the Divine through practices inspired by Jewish mystical tradition. He embraced a liberal ethos, championed equal roles for men and women in religious life, welcomed gays and lesbians, and promoted doctrines such as eco-kashrut that integrated contemporary concerns into Jewish practice. Reb Zalman pioneered groundbreaking ritual innovations, including meditation, ecstatic dance and the use of drums and other musical instruments in musical services. He became a champion of a creative approach to halachah, always asking what was the goal of the halachic injunctions, and then finding creative ways to make those goals come alive in the experience and imagination of those he was teaching. Yet, he was also strongly attached to the orthodoxy of his mentors in the Chabad movement. When he began ordaining rabbis as part of the new Jewish Renewal movement he was creating, he insisted that they observe the mitzvot. He wanted to be sure that his ordinations were recognized in Israel and in the orthodox communities of the U.S. in order to ensure that he wasn’t participating in further splitting the Jewish people. In 1995 he accepted the World Wisdom Chair at the Naropa Institute (now Naropa University) in Boulder, CO from which he officially retired in 2004. His greatest interests in his last years were two-fold. He was engaged in teaching about “spiritual eldering” which later developed into his popular book, From Age-ing to Sage-ing, and led to his founding the Spiritual Eldering Institute. And second, he wanted to articulate the foundations of a new manifestation of Hasidism, which he called “The Fourth Turning of Hasidism,” and to contribute to the evolving understanding of religion and spirituality. 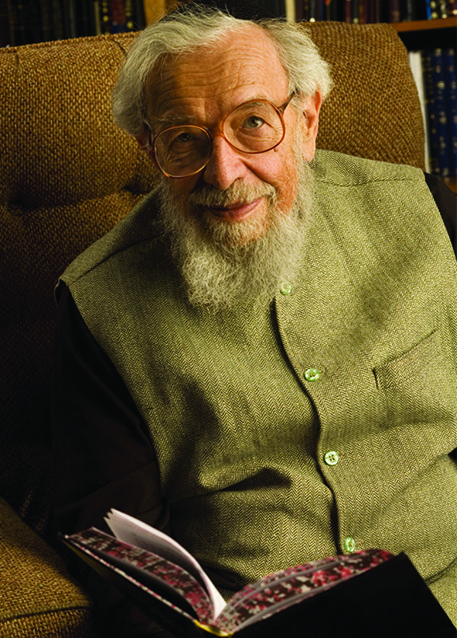 During the last decade of his life, he received many seekers from all over the globe in his study in Boulder, taught classes all across the U.S. and Canada, and wrote a number of books including: Jewish with Feeling: A Guide to Meaningful Jewish Practice (2005), A Heart Afire: Stories and Teachings of the Early Hasidic Masters (2009), Sh’ma’: A Concise Weekday Siddur for Praying in English (2010), Gate to the Heart: A Manual of Contemplative Jewish Practice (2013), and collaborated on The December Project (2014) with author Sara Davidson. Pardes Hannah is the Jewish Renewal Community of Ann Arbor, led by Rabbi Elliot Ginsburg who received his rabbinical ordination from Reb Zalman in 1998. Reb Elliot founded Pardes Hannah in 1994 to bring this powerful practice of Judaism to the local community where he is also a professor of Judaic Studies at the University of Michigan. A charismatic and infinitely accessible teacher, he was able to tap-in to the particular need and interest of a generation ready for a paradigm shift in consciousness. His expansive personality and brilliantly creative mind never found a place to rest, but continued to push the margins of spiritual growth, using the language of emerging technologies and ecological awareness. Nevertheless, he was deeply committed to restoring vitality to as much of tradition as was possible, and to “re-formatting” it for modern use. In many ways, this was his particular genius, to build the “spiritual technology” of the future from the traditional wisdom of the past. Reb Zalman’s rabbinic and kabbalistic erudition, his breadth of vision, and most of all his vastness of heart will never be forgotten by those whose lives he blessed with his presence. No one else in the 20th/ 21st century brought such new life, new thought, new joy, new depth, new breadth, new ecstasy, into the Judaism he inherited –- and transformed. Rabbi Shefa Gold, the inspirational composer and performer of spiritual music and leader in the Jewish Renewal Movement, will lead a Chant Ritual on Saturday, May 10 at 8:00 pm in honor of the 20th Anniversary Celebration of Pardes Hannah. Rabbi Gold is director of C-DEEP, The Center for Devotional, Energy and Ecstatic Practice in Jemez Springs, New Mexico. Her deep spiritual friendship with Rabbi Elliot Ginsburg, who will be honored at this weekend Shabbaton, brings her to Ann Arbor to help the Pardes Hannah Renewal Community celebrate. Shefa is on the faculty of the Institute for Jewish Spirituality and includes her understanding of Buddhist, American Indian, Christian, and Islamic spiritual traditions in her teachings, finding the underlying core of devotional energy in each faith system. For more information on Rabbi Shefa Gold, see www.rabbishefagold.com. Rabbi Shefa Gold will be presenting a Chant Ritual with music and story to honor Rabbi Elliot Ginsburg and the 20th Anniversary of Pardes Hannah at 8 pm at the home of Linda and Richard Greene. The $25 contribution will support the Pardes Hannah community. For more information or to register, Click Here. Rabbi Elliot Ginsburg has been the prime mover, rebbe and spiritual explorer, behind the growth and flowering of Pardes Hannah, the Jewish Renewal community in Ann Arbor. Twenty years ago this year, Reb Elliot and a few pioneering souls created an intimate setting where people could enter deeply into prayer with chanting, kabbalistic meditation, and openhearted wrestling with Torah. This community has attracted members committed to drinking deeply from the wellsprings of tradition while exploring new avenues of spiritual expression and experience. Pardes Hannah members, students, rabbis, and friends from across the country are gathering together the second weekend of May, 9-11, to celebrate the 20 year Anniversary of Pardes Hannah and acknowledge Reb Elliot’s inspiring role as rabbi and teacher. As a professor of Judaic Studies at the University of Michigan, a scholar in residence in numerous academic and community settings, and a teacher and mentor of rabbinical students, Reb Elliot has touched hundreds of young and older people yearning to find the balance between the forms of tradition and the spontaneous ebb and flow of lived life. When Pardes Hannah began as a small minyan 20 years ago, it was an intimate gathering, based on a havurah model of prayer. Rabbi Dobrusin was always very supportive, and Beth Israel invited the community to use a room in their 2010 Washtenaw Avenue building for services, the location the group still meets on the first Shabbat morning each month as well as at other times for Reb Elliot’s teachings. This is the location of Shabbat services, lunch, and teachings on May 10, led by a variety of rabbis and teachers from across the country. There will also be a Kabbalat Shabbat pot-luck dinner and service on Friday evening to welcome Shabbat and guests. A highlight of the weekend will be a Saturday evening Chanting Ritual led by Rabbi Shefa Gold, one of the most well-known and respected chant leaders in the American Jewish community who lives and teaches in New Mexico. Rabbi Gold is founder of C-DEEP, and leads the Kol Zimra Chant Leaders Training Program – the only one of it’s kind in the nation. All these events are open to interested participants. More information will be available about the Shefa Gold Chanting Ritual, which will be an opportunity for Pardes Hannah to fundraise to support its growing community. Click Here for more information about this 20th Anniversary Celebration. …you will find teachings, musings, and pearls from Rabbi Elliot Ginsburg. We’re still developing this page, so please check back soon to see where it might be leading.